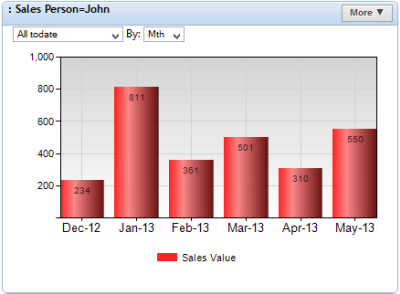 Using Dashboard software for KPI management can be a lot quicker and easier compared to using programs like MS Excel . But, even if you’ve created dashboards, editing them to show different perspectives on your data can be just as time consuming. You might even have to go through the process of creating a new dashboard altogether. How can you get the data comparisons and information you need instantly? A great way to do this is to allow users to let users interact with the dashboard directly. In this article, you will learn how Interactive dashboards can save you time and effort, and how you can take the first steps to make your own dashboards Interactive. It’s no surprise that many companies are requesting custom, interactive dashboards. These dashboards offer several advantages to users over ‘regular’ dashboards (i.e. simple charts arranged together). Imagine that you’re looking at your data in a dashboard, and you suddenly realise, ‘I need to see this data in a different way to decide what actions to take.’ If you had to go back and make changes to your charts and filters, save changes and then display them, decision making would take a long time indeed. Giving users the ability to make these changes automatically makes interactive dashboards more efficient, letting users get the answers they need quickly. Also, interactive charts let users fit many data visualizations into a small space without adding more charts onto a dashboard. 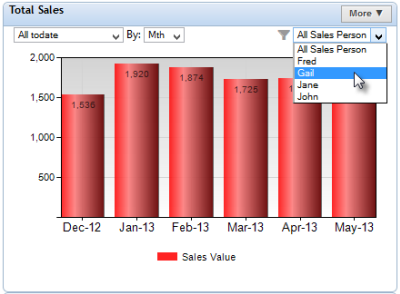 If your dashboard software has the ability to duplicate your charts (as Target Dashboard can do automatically), then you can easily configure one chart back to its original view, and compare the two. By giving users options to manipulate their data automatically (which will be discussed later in this article), this inevitably encourages them to make use of these options. Being able to spontaneously change data visualisations without fear of losing the original charts gives managers more freedom. They can experiment and uncover different aspects to their data that they wouldn’t have thought of before. So, how can you add Interactive elements to your dashboard that help decision making? Here are some useful tools that are easily implemented in dashboards. 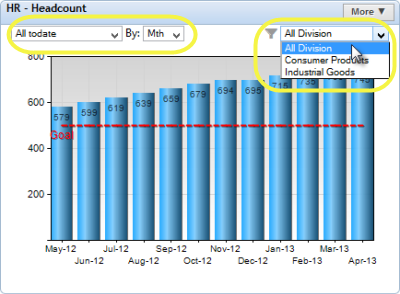 In fact, in Target Dashboard, many of these are added automatically to certain charts! However, the most important thing to consider when implementing interactive dashboards is that the interactive elements should not interfere with the chart’s usefulness , or included just for the sake of it. Interactivity should make decision making quicker and easier, so an interactive dashboard without a clear purpose can result in it becoming cluttered and ineffective. In order to make the best possible business decisions, managers often analyze the trend information in their data. 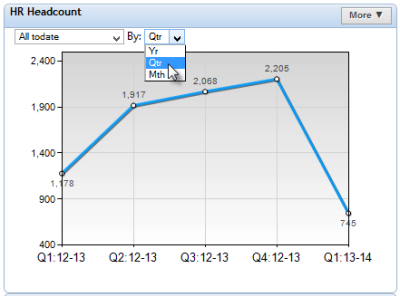 This is best done using a chart such as a line chart, which best shows this direction-based information. In the above example the timeline of the information is by month. If managers were to make their decisions based entirely on this monthly data, this might not be the best decision because the monthly view obscures quarterly or annual trend information, which might offer insights that require different courses of action. Adding a menu which allows the timeline to be changed automatically on the chart is therefore a great way to quickly switch between multiple perspectives of the same data, keeping each fresh in the user’s mind. Also, the menu does not take up a lot of space, meaning the chart does not sacrifice readability. What you also might have noticed is the menu at the uppermost left, which is a little different from the timeframe modifier. This acts as a filter for your data, which can be used to see a certain part of your data for closer analysis (e.g. 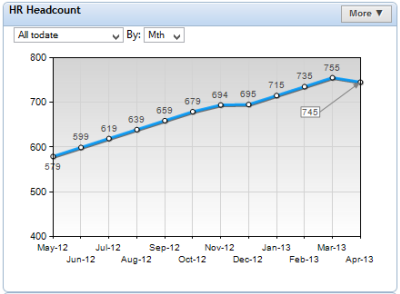 only the last 6 months, financial year views). Using these two menus in combination, you can get the full picture of your data. As I just mentioned, the time based filters are really useful for putting your data into different views for comparison. However, instead of simply getting rid of data that falls outside a certain timeframe, it is also very useful to be able to split your data by the categories that comprise it , e.g. by the different salespeople which generate a sales revenue KPI. Usually, when applying a categorical filter to your data, the data is filtered and the new view displayed as a standalone. This means you have to repeatedly create new views to see all possible facets of your data. However, if you implement a method for switching between categories on your dashboard, you can quickly compare data and further analyze it in seconds. The ability to quickly switch between data views gives a chart more flexibility for its users, and again lets users experiment with different views. The last element of interactive dashboards I’m going to cover is the data drilldown. 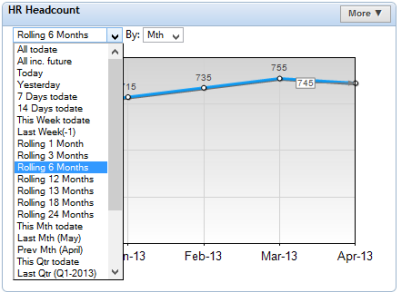 Data drill-downs allow you to delve more deeply into your data, showing the complex information underneath your KPIs. This is most useful in categorical charts such as pie charts, where the value changes over time are lost. Because categorical charts do not have a time measurement, trend lines and changes over time are useful to include in a drilldown. While it can be useful to see how your data is made up categorically, users need time based data to give it context. 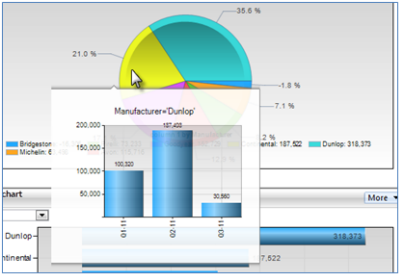 In the case of the drill-down above (created in Target Dashboard), the drill-down can be accessed be hovering over each section of the pie chart. This means that data can be accessed and dismissed in an instant, which is an advantage for users without much time for in depth analysis. Interactive Dashboards Make Decision Making Quicker and Easier! This article has shown you three ways which you can let users interact with dashboards, and therefore save time and effort in decision making. While you can use these as ideas for your own KPI dashboard, you could just let Target Dashboard implement these for you automatically! See a demo and watch your data as it goes up on an example interactive dashboard in minutes!